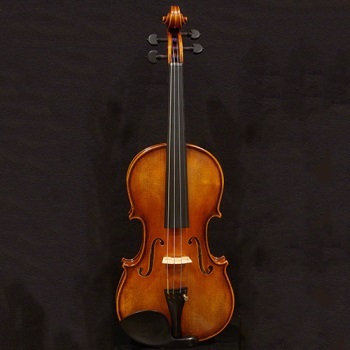 This excellent intermediate violin features quality craftsmanship throughout, and a pleasing appearance. The two piece book matched maple back has a nice tight flame, which complements the lighter flame ribs and neck, and even grained spruce top. The varnish is an amber-orange over an amber ground which has been very tastefully antiqued, giving the appearance of an instrument that is much older. The tone is warm but very pure, and the response is quick and gratifying.